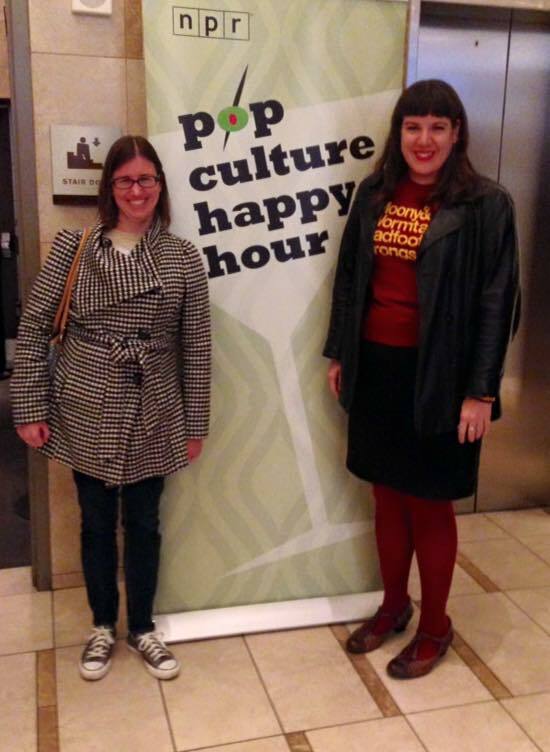 Last night my friend Heather and I went to a live taping of the Pop Culture Happy Hour podcast. She was already down in DC for work during the afternoon, so I took the train down and met her. We grabbed dinner at the Right Proper Brewing Company, which is right next door to the theatre. After eating at Proper Restaurant in Tucson last weekend, this makes the second weekend in a row I’ve eaten at a restaurant with Proper in its name. Stay tuned to see if I manage to eat any restaurants called Proper in Philly next weekend. The food was tasty. I had a fried green tomato sandwich. The menu had sort of a Southern vibe going on and they even served Cheerwine. I don’t actually like Cheerwine, but I always like seeing it places outside of the South. They didn’t have any sweet tea though, so they weren’t that Southern. Based on the time we met up and subsequently finished dinner we had lots of time before the show started. We decided we go over to the theatre and start the line. Turns out that its NPR’s Week in Washington where they bring lots of big donors to the city and treat them to a variety of events, so there was a pre-show reception for them going on when we got there. We got inside the lobby with them, but were then told we couldn’t actually go inside the theatre yet. So us and 4 other people who beat us there got wait inside while the rest of all the people who started showing up had to wait outside. Heather had actually help make a costume for Petra Mayer, who works for NPR books. She came out and chatted with us for awhile while we were stuck in the lobby and introduced us to Audie Cornish, who was there as a guest on the podcast. Petra also saved us some seats in one of the booths on the side, which was great since there weren’t enough seats for everyone that was there and some people had to stand for the show. We were there early enough that we would have been fine getting seats anyway, but it was nice not to have to worry about. Normally the podcast is Linda Holmes, Glen Weldon, and Stephen Thompson plus a rotating guest panelist who usually works for NPR or is at least an NPR contributor. That seat as I already alluded to filled by Audie Cornish for this show. They also had Fred Armisen as a guest, which is not the kind of thing they’ve ever really done with the podcast before. I assume it’s partly because they had it as event for the Week in Washington guests as well as the fact that they were perhaps trying to people a little more for there money with the move to the larger venue. They have been moving the show into progressively bigger spaces, the Howard Theatre definitely being the biggest to date. Obviously with moving outside of the NPR building itself and into a bigger venue comes with higher overhead, which means ticket prices have to be increased. I would have been fine paying the $25 just for the regular podcast, but Fred Armisen was a nice bonus. I’m not sure how they’re actually going to air this podcast as episodes because it wasn’t really the same as what they’ve done at other live shows. Normally they tape two back to back episodes, which it didn’t seem like they did this time. It didn’t run quite the whole hour and half that was listed on the tickets, which would definitely mean it’s too short for two of their typical 45 minute episodes. I’m guessing it will just air as one longer than normal episode. The show started out with Fred Armisen coming out and playing a song, which I gather from some conversations after the show was a last minute thing he requested to do, which seemed to be somewhat the way he operates. Then just the four people from NPR came out and did a segment discussing things they find the most scary. 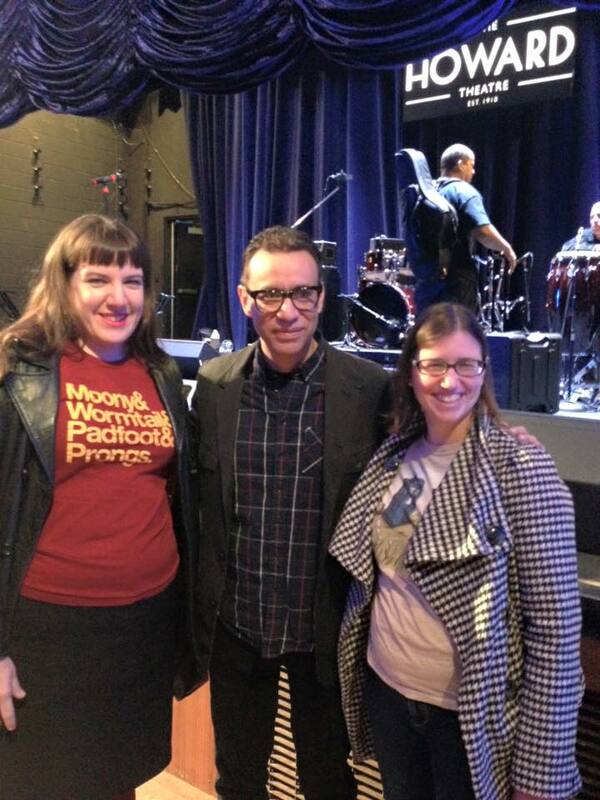 After that Linda did an interview with Fred Armisen, which he just sort of ran away with at times. The final segment was a quiz, which is something Linda likes to put together for the live shows. This one was about Halloween episodes of old sit-coms. Audie Cornish is my favorite guest panelist and it cracks me up how competitive she gets over these dumb quizzes. Last night was no exception. They ended as always with a segment on what’s making them happy this week. That was the end of the scheduled show, but then Fred, who as I mentioned seemed to be in his own little show, decided they should have a Q&A with the audience. Given that there was something else scheduled in the theatre that night and they obviously had a time they needed to be off stage I could see some panicked faces up there, but they did let three people ask questions. After the show everyone stuck around for people who wanted to talk to them. Fred was very happily greeting and taking pictures with everyone who wanted to meet him. I also heard he went up to the reception before hand to meet and greet the big donors, which was something he wasn’t contractually obligated to do, so he definitely seems to be someone who is very happy to meet and talk to fans or just people in general I guess. As always it was an enjoyable show. It’s always fun to go and actually see them recording in person since you do pick up on stuff visually that you just don’t get when you only have audio. It’s also of course fun to be amidst a crowd of fans enjoying themselves as well.